Announcement Choose REAL jewelry with REAL stones & gems, made by REAL people. SHOP NOW or send us a note, and we'll help you find your next favorite piece of jewelry or a special gift. Handcrafted with rare stones & gems, our jewelry reflects our life-long love of beauty and integrity in design and materials. We search out the most special real stones from around the world, and design and make each piece to be beautiful, great to wear, and made to last. Choose REAL jewelry with REAL stones & gems, made by REAL people. SHOP NOW or send us a note, and we'll help you find your next favorite piece of jewelry or a special gift. Very nice, good color as shown! Arrived very fast. 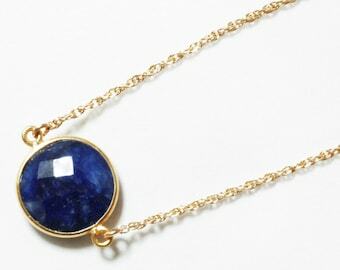 The necklace I ordered is absolutely beautiful!! Shipping was fast and customer service was awesome! Thank you so much!! 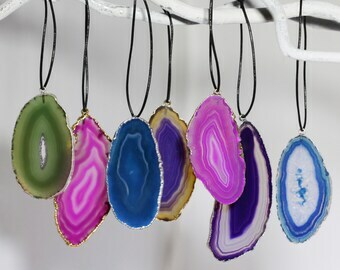 Making jewelry gifts for loved ones make our day! 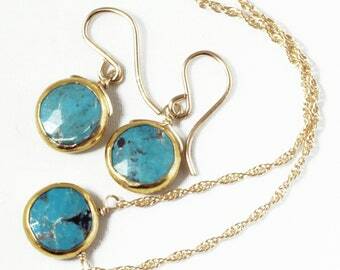 We're drooling over these yummy blue opal stones wrapped with gold bezels! The pink necklace looks lovely, but our multi-strand pink tourmaline necklace would do well to bring out those deep mauve tones in this Oscar de la Renta gown, don't you think? ...And the Bride Wore Geodes. Let us help you with your big event! 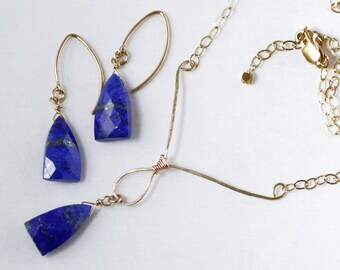 Working surrounded by strands of Lapis glamour. 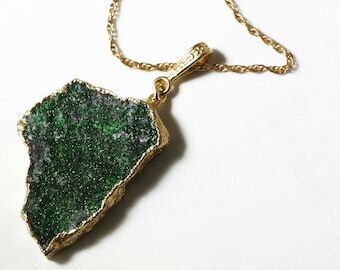 Rare Uvaravite Stones, aka Green Garnet, makes a Museum-quality OOAK Statement Necklace! Rare Spirit Quartz, highly prized for it's scarcity and metaphysical properties. We are Elizabeth & Victoria, two sisters from the San Francisco Bay Area who grew up gathering shells on Pacific Ocean beaches and searching for beautiful stones at Sierra Mountain lakes. After years of work in fine jewelry, gemology, and interior design (Elizabeth), and graphic design and photography (Victoria), we have joined together to follow our true calling – creating jewelry crafted from the beauty of the natural world. For us, creating jewelry is a world of discovery, imagination, and creativity, sparked by our passion for the beauty of minerals, gems, jewelry, and fashion. Our inspiration comes from the natural world of mountain light and ocean shores, of lakes and streams, of rocks and sand, the sky, the stars, and the gems of the earth. Awash in the thrill of the hunt, we search for the most beautiful and rare rocks, minerals, semi-precious and precious gemstones from far away lands. 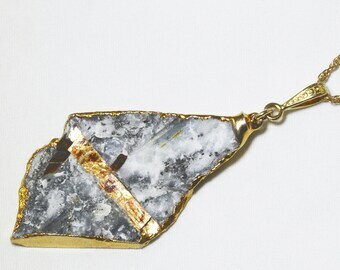 At the same time, we look for the romantic origins of our discoveries, as each of our exquisite, crafted pieces has a story to tell: from ocean-blue Aquamarine nuggets from Brazil, raw Sapphires sifted from Tanzania’s Umba River Valley, bright Bumblebee Jasper formed in Indonesian volcanoes, to Aragonite from the desert sands of Morocco. We have forged long-standing relationships with trustworthy suppliers from remote corners of the world, and have woven a circle of knowledgeable industry experts and ethical sources. We follow ethical workplace practices, were early members of Ethical Metalsmiths, and make every effort to use recyclable and sustainable materials whenever possible. 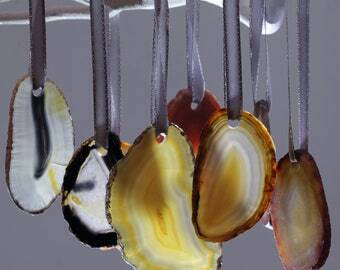 The great forces of the earth shape the elements and components of our jewelry, and it is our great privilege to craft pieces to best catch the light, enhance your fashions, and capture the beauty of these real minerals, stones, and gems, in a way that can be worn and enjoyed every day. Welcome to Elizabeth Lydon Studio! Hand crafted with rare stones & gems, our jewelry reflects our life-long love of beauty and integrity in design and materials. We search out the most beautiful stones from around the world, and design each piece to be beautiful, great to wear, and made to last. 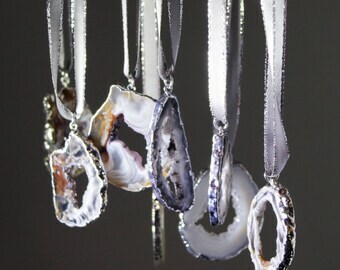 We welcome custom orders to bring your jewelry dreams to reality! 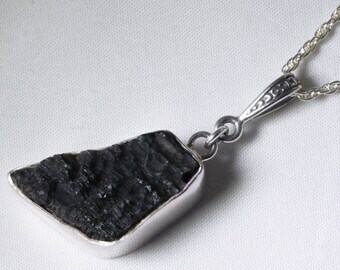 We take great pride in the quality and craftsmanship of our jewelry. Attention to beautiful design, materials, and long-lasting wear are our priority. Upon receipt, please inspect your purchase carefully and notify us of any damage within 48 hours to discuss repair/replacement/exchange. If you are dissatisfied for any reason, you may return your purchase, within 30 days, for a refund of the item's purchase price. We cannot accept returns on custom made or special orders, or jewelry on sale. To return an item, please send us a note. Wrap your jewelry carefully, and send it, (insured, for your own protection) to: Elizabeth Lydon Studio, 6114 La Salle Ave. #749, Oakland, CA, 94611. Once the jewelry arrives here safely, we will submit your refund via the same method of your purchase, and send you a note to confirm. Our high standards include providing the best customer service we can. If there is ever a problem, please send us a note right away! Your satisfaction is very important to us. Thank you for your business! Elizabeth Lydon Studio accepts major Credits Card (Visa, MC, Amex, Discover), PayPal, and personal checks. We require payment within 7 days of order. Items paid by personal check will ship after the check has cleared both banks. SHIPPING will occur 3-5 business days from ordering. If you need faster shipping or choose Upgraded Delivery (FedEx Overnight or 2Day), please write to confirm we can accommodate your timing needs. We will do our best to meet your schedule! GIFT-GIVERS: If your package is being sent directly to your gift recipient, please send us a message RIGHT AWAY to let us know, along with a brief note for the gift card. We will hand-write the card for you, wrap it with care, and ship the package without an invoice. We ship Monday-Friday; no shipping on Saturdays, Sundays, or Holidays. Custom orders and changes may take longer; we will send you a note with estimated timing. If you need a quicker turnaround or choose Upgraded Delivery (FedEx Overnight or 2Day), please write to confirm we can accommodate your timing needs. We will do our best to meet your schedule! International Customers Please Note: The shipping charge does not include customs, duty, VAT, taxes, fees, etc. (or UK £8 handling fee for every order). Customers are responsible for all additional fees or taxes applied by their county's customs or postal service. Delivery time varies dramatically from country to country (send us a note if you'd like to know recent delivery timing to your country). We welcome your ideas and conversations about custom orders. If we are making a custom item for you, we will confirm price and timing with you, before proceeding. We specialize in Custom One-of-a-Kind Jewelry. It takes vision, creativity, and great communication to make the right custom design. 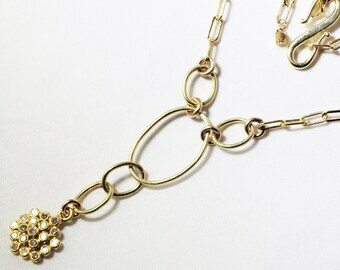 We have had such fun creating jewelry that our clients have only dreamed about, and would love to discuss any project. Contact us to create designs for your dream Wedding! We love to make the Bride's day sparkle, and can match almost any color, style, and budget. To fulfill your order, you must provide us with certain information (which you authorize Etsy to provide), such as your name, email address, mailing address, payment information, and the details of the product that you’re ordering. 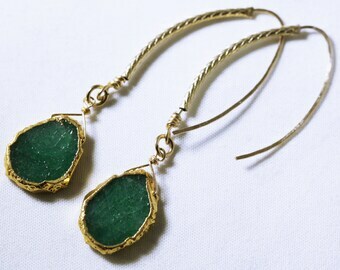 You may also choose to provide us with additional personal information (e.g., for a delivery or custom order of jewelry), if you contact us directly. • Service providers. We engage certain trusted third parties to perform functions and provide services to our shop, such as delivery companies (e.g., USPS, FedEx). We will share your personal information (i.e., name, address, info needed for shipping) with these third parties, but only to the extent necessary to perform these services. • Compliance with laws. We may collect, use, retain, and share your information if we have a good faith or belief that it is reasonably necessary to: (a) respond to legal process or to government requests; (b) enforce our agreements, terms and policies; (c) prevent, investigate, and address fraud and other illegal activity, security, or technical issues; or (d) protect the rights, property, and safety of our customers, or others. If you wish to correct or delete personal information held about you by Etsy, you should contact Etsy at Etsy.com/help.